With the winter weather firmly behind us we are now getting on with our site surveys, field testing and consultancy work. Some members of the company have been fortunate enough to get away for some winter sun. Our operations have seen us travel to the US, South Africa, Tanzania, Saudi Arabia, Turkey and Yemen. Sports Labs have added another accreditation to our already impressive collection. Sports labs constantly strive to be at the forefront of technology and the organisations that govern and support the industry. The Synthetic Turf Council is based in Atlanta and we hope that by having this membership we can further increase our work in North America and Canada. Richard and Eric attended the Spring Membership Meeting in Arizona where they met with some very interesting people. This was a very positive start to our attempt to work in North America and Canada. Our operations in South Africa are continuing to prove very successful. The 2010 OC's Legacy Programme has transformed the sports facilities in South Africa and has provided a constant stream of work for our UJSportslabs JV. Jason Halliday from our Head Office Lab Team in Livingston is there on secondment to South Africa to assist with the increased workload. We hope the Jason enjoys his time there and we are sure his experience will further strength the team in South Africa. Eric has managed two trips to South Africa this year so far to catch up with our clients in the area for discussions for the year ahead. As we have mentioned, the workload for South Africa is ever increasing, a trend which we hope will continue. 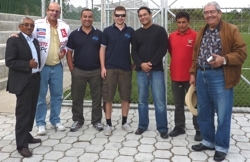 Keith from our Head Office and Mete for our Turkish lab travelled to South America for almost 3 weeks of field testing. Sports Labs won a FIFA tender to test pitches in countries such as Uruguay, Paraguay, Ecuador, Chile and Venezuela. With temperatures exceeding 40°C and some pitches thousands of feet above sea level, we're sure it's not the easiest field testing in the history of Sports Labs, but a terrific trip none the less. Our consultancy practice also continues to do well and have many projects lined up for the summer season. We are continuing to build on our relationships with the independent school market and will be exhibiting at the annual ISBA conference next month at Celtic Manor in Wales. We are confident that our attendance will be equally as successful for us as it was last year... maybe more so! We are delighted to announce that due to an increased work load in our testing lab we had the need to recruit another member into the team. We are pleased to have Robbie Blair join the lab testing area of the business. Robbie's background has been project management and we are thrilled with the effect he has had in the lab. We hope that Robbie continues to settle in well as a full time member of staff and that his skills and experience continues to have a positive effect on our operations. A great deal of time, effort and money has been spent in the laboratory in the last few months. We have developed our testing kit so that we now have a new AAA and AA, a ball cannon and a new entire flight kit. The new flight kit will be invaluable to the field testing staff, making foreign travel a lot easier. It's hard to believe that it's almost Easter, it feels like only yesterday it was Christmas. Sports Labs have began 2011 well and are very excited about our future plans for America &amp; Canada, Central Europe and the Far East. We shall update you all soon on our progress. Please watch out for our newly designed website - coming soon!